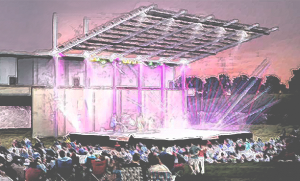 Levitt Houston joins the Levitt network of music venues in Los Angeles and Pasadena, Calif.; Memphis; Arlington, Texas; Bethlehem, Pa.; Westport, Conn.; and Denver, Colo., which will open in 2017. Scheduled to open in 2021, Houston’s sustainably designed, state-of-the-art Levitt Pavilion will present 50 free concerts annually—everything from World music to blues, country to Latin, children’s to jazz—all acclaimed talent. Houston, the fourth largest city in the country with a diverse metropolitan population of over six million, has a history of flooding every year from hurricanes and tropical storms heading inland from the Gulf of Mexico. Following a series of catastrophic floods in the 1980s-90s, Project Brays, a $450 million joint effort of the Harris County Flood Control District and the U.S. Army Corps of Engineers, was established in 2000 for flood control improvements. Willow Waterhole, located in a section of Houston’s Westbury neighborhood, contained contaminated brownfields and abandoned buildings from years of flood damage. Willow Waterhole became a significant component of Project Brays when the site was allocated $75 million to create major infrastructure to reduce flood damage each year. Recognizing Willow Waterhole’s potential to be more than just a flood control zone, local citizens banded together in 2001 to create the nonprofit Willow Waterhole Greenspace Conservancy. They envisioned Willow Waterhole as a major new park that could revitalize the area as well as create needed green space and provide recreational amenities. Since opening in 2006, Willow Waterhole has played a critical role in reducing flood damage through a series of interconnected lakes that function as storm water detention basins. Surrounding these lakes are expansive, open green spaces where people can enjoy nature in the heart of their city. 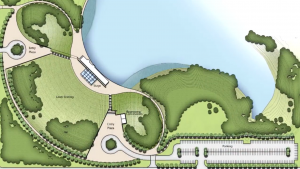 Plans for the venue put the stage at water’s edge. While Willow Waterhole has become popular for bird watching (over 150 species have been spotted), picnicking and hiking on its numerous walking trails, Conservancy leaders sought to fully realize the park’s potential as a citywide destination. With activities like an annual jazz festival and outdoor movie screenings that have attracted families from the neighborhood and beyond, the stage was set for major programming moving forward. In 2012, Conservancy leaders contacted Levitt Pavilions in the hopes of bringing the Levitt program to Houston. When Levitt Houston’s $7 million capital campaign launched in November 2013, already at work was the public/private partnership behind the scenes—with the City of Houston’s Parks Department, City Council District K, Harris County, Bray Oaks Management District, Willow Waterhole Greenspace Conservancy and local community leaders in the Westbury neighborhood—to help make the dream of building a performance space open to all a reality. When Levitt Pavilion Houston opens, it will be a shining example of a community working toward a sustainable future and promises to become a vibrant, beloved place for all Houstonians to enjoy. Houston’s Westbury neighborhood came together to breathe new life into the community following catastrophic flooding. Watch the fascinating evolution of the neighborhood, the creation of Willow Waterhole Conservation Reserve and the beginnings of Levitt Pavilion Houston in this video.